In 1937 W. L. Bragg published a method for classifying all kinds of silicates and their crystal structures based on the concept of the ionic theory by L. Pauling. The fundamental unit is a tetrahedral complex consisting of a small cation such as Si4+, or Al3+ in tetrahedral coordination with four oxygens (Pauling’s first rule). Many textbooks explain the geometry of the SiO4- tetrahedron and other mineral structures as determined by the relative sizes of the different ions. This ionic coordination representation is no longer adapted to the requirements of geopolymer chemistry that is governed by covalent bonding mechanisms. Not ionic (tetrahedral) but covalent ! In the figure below, six atomic arrangements are used to illustrate the silicate ionic structure on the one hand, and the siloxonate/sialate covalent construction on the other hand. – Si has 4 electrons. It is a donator or an acceptor (tetra-valence). – O has 6 electrons. It is a receptor (di-valence). – Al has 3 electrons. It is a donator in acidic medium (tri-valence) and a receptor in alkaline solution (tetra-valence). – Na has 1 electron. It is a donator (mono-valence). b) Ionic concept tetrahedron, coordination: The ions (Si4+, 4O–) build the single tetrahedron. Si donates 4 electrons to the 4 oxygens and turns into a small cation Si4+. Si is tetracoordinated with the 4 oxygens. To achieve anionic stability, each oxygen needs an eighth electron supplied by a metal (Na, K, Ca, Mg, Fe, etc.) or another Si, not shown on the Figure. c) Ionic concept: By the mutual sharing of one oxygen anion O2-, two or more tetrahedra may link to form polyanionic groups. d) Covalent concept: The molecule (SiO4) results from the co-sharing of electrons between one Si atom and the four surrounding oxygens yielding Si-O covalent bonds (tetravalence). 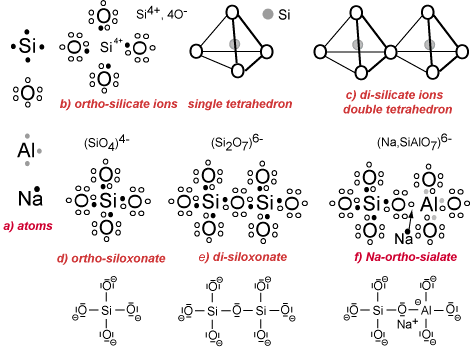 The ortho-siloxonate molecule (SiO4)4- requires additional metallic ion donators (Na, K, Ca, Mg, Fe) not shown on the figure. e) Covalent concept: The polycondensation into di-siloxonate and higher polymeric siloxonates occurs by additional co-sharing of electrons between Si and O. The di-siloxonate molecule (Si2O7)6- requires additional metallic ion donators (Na, K, Ca, Mg, Fe). f) Covalent concept: The formation of the ortho-sialate molecule with the covalent bond Si-O-Al- occurs in alkaline medium. The Al atom takes the single electron pertaining to a metalloid (Na for example) and becomes tetra-valent, like Si, with an additional negative electrostatic charge. The Na+ cation is strongly attached to the sialate molecule and balances the negative charge. The differences between the ionic concept (coordination) and the covalent macromolecular bonding are profound. The double tetrahedron in structure (c) is sharing one oxygen anion O2-, whereas in the di-siloxonate molecule of structure (e), the covalent bond is achieved through Si and O co-sharing only one electron. This results in stronger bond within the latter structure. The geo-chemical syntheses are carried out through oligomers (dimer, trimer, tetramer, pentamer) which provide the actual unit structures of the three dimensional macromolecular edifice. 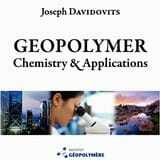 See in J. Davidovits’ book, Geopolymer Chemistry & Applications, the Chapters 2, 5, 6, 7 and 8. The geopolymerization kinetics for Na-poly(sialate-siloxo) and K-poly(sialate-siloxo) are slightly different. This is probably due to the different dimensions of the Na+ and K+ cations, K+ being bigger than Na+. Step 3: the subsequent course of the reaction can be explained by the cleavage of the siloxane oxygen in Si-O-Si through transfer of the electron from Si to O, formation of intermediate silanol Si-OH on the one hand, and basic siloxo Si-O- on the other hand. Step 4: further formation of silanol Si-OH groups and isolation of the ortho-sialate molecule, the primary unit in geopolymerization. Step 5: reaction of the basic siloxo Si-O- with the sodium cation Na+ and formation of Si-O-Na terminal bond. Step 6a: condensation between ortho-sialate molecules, reactive groups Si-ONa and aluminum hydroxyl OH-Al, with production of NaOH, creation of cyclo-tri-sialate structure, whereby the alkali NaOH is liberated and reacts again and further polycondensation into Na-poly(sialate) nepheline framework. Step 6b: in the presence of waterglass (soluble Na- polysiloxonate) one gets condensation between di-siloxonate Q1 and ortho-sialate molecules, reactive groups Si-ONa, Si-OH and aluminum hydroxyl OH-Al-, creation of ortho-sialate-disiloxo cyclic structure, whereby the alkali NaOH is liberated and reacts again. Step 7: further polycondensation into Na-poly(sialate-disiloxo) albite framework with its typical feldspar crankshaft chain structure.